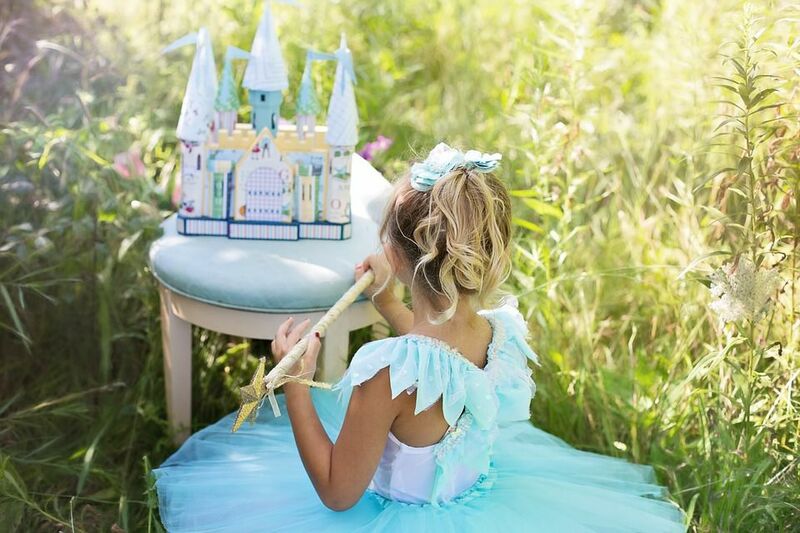 If your child's party has a princess theme, engage the kids in some of these fun and fabulous princess party games. If you have knights at your party, too, you might also try some knight and princess party games. Either way, the kids are in for a royally grand time. These games are all appropriate for ages 5 and up. Cover the floor of a room with pink balloons filled with regular air, not helium. Hand each child a magic wand and tell the kids they must use them to keep the balloons in the air. The wands can be purchased from the toy store, made ahead of time by you, or made by guests as a princess party craft. The game can be noncompetitive—just have the kids keep playing until they're tired of it. Or, you could make it a contest by having kids sit out when their balloons touch the floor. The last princess (or knight) left standing wins the game. This game works well when you have at least eight children at the party. You will need one chair for every child, minus one. For example, if there are 15 kids at the party, use 14 chairs. Arrange the chairs in a circle so that the seats are facing inside. Choose one player to stand in the center of the circle. This player is The Queen. Have the remaining kids sit in the chairs facing her. To start the game, The Queen approaches one of the seated children and says, "Mirror, mirror, on the wall, who's the fairest of them all?" The player who is approached must come up with an answer, such as "The fairest one of all has a pet puppy," or "The fairest one of all is wearing tennis shoes," and then anyone with a dog or wearing tennis shoes must stand up and scramble to find a new seat. The players cannot shift to the seat next to them, should it become vacant. They must move at least two chairs away from their original spot. In the meantime, The Queen should try to sit down in one of the vacant chairs. Once everyone finds a spot, the one player left standing becomes The Queen, and must then approach a new seated player and ask, "Mirror, mirror, on the wall, who's the fairest of them all?" There's no definitive end to the game and no winner. Repeat as long as the children are having fun. To play this game, you will need a tiara for each player. Set all of the tiaras up in a row on a table or on the floor (make sure there is enough room for the kids to move around the area). Remove one tiara so you have one less than you have players. Play a princess song (choose from the soundtrack of the birthday child's favorite princess movie) and have the players circle the row of tiaras. Similar to the classic version of musical chairs, when the music stops, the kids must grab a tiara and place it on their heads. The princess left without a tiara is out, the music begins again, and play continues for as many rounds as it takes until there is only one princess left in the game. This is played like freeze dance, but when the music stops, instead of freezing in place, princesses have to "faint" to the floor and fall asleep. When the music starts again, the spell is broken, and players can get up and continue dancing. If your child's princess party has a Little Mermaid theme to it, hold a fin-legged race. Divide the kids into teams of two and tell them they're mermaids and must "swim" across the ocean (your backyard) to reach the shore and become human. Tie their inside legs together with ragged strips of green fabric. The team that reaches the finish line first wins.